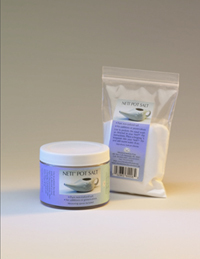 Perfect for use with the Nasaline wash system, or the Neti Pot™ Salt is the highest purity salt commercially available. It is non-iodized and contains no additives or anti-caking agents. Use a heaping ¼ teaspoon per Neti Pot™ use. Available in an 10 oz. Jar.